Action: Discard 2 of your success tokens to put Descendant of Eibon into play from your hand or into your hand from your discard pile. At the end of the phase, if he is still in play from this effect, return Descendant of Eibon to your hand. 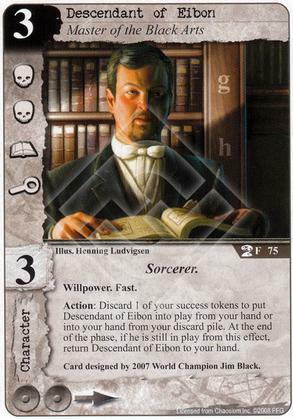 Flavor Text: Card designed by 2007 World Champion Jim Black.